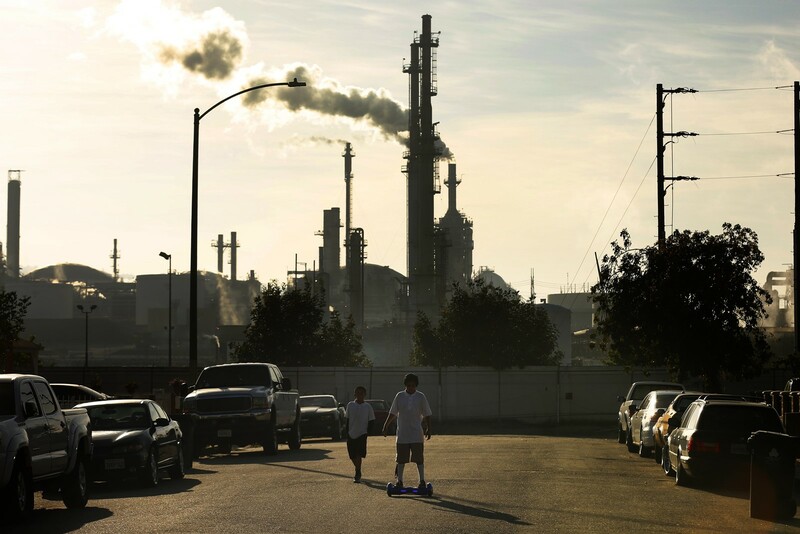 California can’t meet its goals unless it curbs refinery emissions. That’s because refineries are crucially absent from California’s climate change strategy. The state has justifiably gotten credit for addressing issues that the nation won’t — promoting renewable energy, cap-and-trade greenhouse gas emission limits, and electric vehicles — but it has backed off from challenging refineries, the centerpieces of California’s oil supply infrastructure. That’s primarily because refineries have been largely exempted from the state’s cap-and-trade program, which charges fees for emissions. Last year, the Legislature extended the program for another decade, from 2020 to 2030, but only after bowing to the oil industry’s wishes. To win a needed two-thirds majority, cap-and-trade supporters exempted the industry from fees for all but a tenth of refinery emissions through 2030. The legislation also prohibited regional air districts from imposing their own limits on refinery carbon dioxide emissions, a severe blow to communities suffering from pollution from nearby operations. Instead of curbing refineries, these provisions gave them a decade-long free pass. Meanwhile, state policy calls for greenhouse gas emissions to drop by 80% of 1990 levels by 2050. Given the oil industry’s cap-and-trade refinery exemptions in place through 2030, the only way to achieve that level is to place drastic limits on refineries as soon as those exemptions expire, which is unlikely to happen. A more realistic approach would remove the oil industry’s exemptions and impose cuts of 5% a year on refinery emissions immediately — an urgent task that state leaders have shown no interest in carrying out. In the absence of action at the state level, it has fallen to localities to prevent refineries from at least increasing crude oil imports to their facilities. Over the last decade, elected officials in half a dozen communities from Benicia to San Luis Obispo County have blocked refinery infrastructure projects that would allow more crude oil imports. They’re the real heroes of California’s climate saga — too bad they won’t be the ones in the spotlight at the summit.